Peter Puskic was selected as the 2018 recipient for the Tasmanian University Union’s Mount Nelson Award. This award was established by students to recognise not only academic achievements, but also the capacity for an individual to connect with their community and succeed in their chosen field of study. The study of plastic pollution explores the far reach of human impacts on our natural world. Peter understands that only together can we make a meaningful difference and as such is an active voice within his community and aims to continue sharing his story and the plight of our seabirds with as many people as possible. 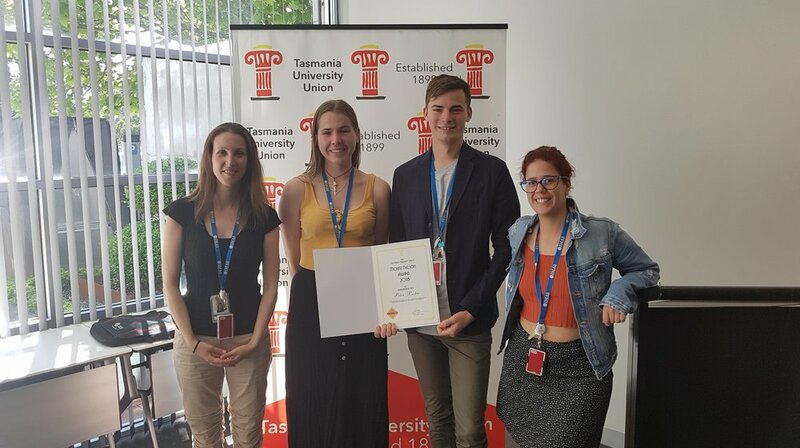 Peter (3rd from left) celebrating his Mount Nelson Award with fellow Adrifters Jennifer Lavers, Megan Grant, and Catarina Goncalves.